Caleb Swanigan makes his way to the rim for a layup. Six players score in double figures, KJ McDaniels leads the way with 17 points and seven rebounds as the Trail Blazers defeat the Lakers and become the 2018 Summer League Champions. 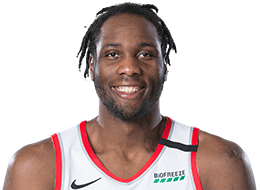 Caleb Swanigan racks up a double-double with 21 points and 16 rebounds to lead the Trail Blazers to a 97-92 victory over the Grizzlies and advance to the 2018 Summer League Championship. The Trail Blazers beat the Celtics 95-80 and advance to the semifinals as John Jenkins led the team with 25 points. Wade Baldwin IV scores 16 points and dishes out nine assists as the Trail Blazers get the 95-89 win over the Spurs. Jake Layman posts 23 points and grabs four rebounds as the Trail Blazers defeat the Hawks, 85-68. Wade Baldwin IV dropped 20 points while Caleb Swanigan chipped in a double-double as the Blazers get a 93-78 win over the Jazz at Summer League. Caleb Sawnigan passes to a cutting Zach Collins who spins and hits the layup. Caleb Swanigan gets the feed in the lane and finds Ed Davis who converts inside. C. J. McCollum and Damian Lillard shoot a combined 9-17 from 3-point land as the Blazers edge the Magic 99-94. Evan Fournier scored 22 points for Orlando in the loss. Damian Lillard's 15 points and 7 assists propel the Blazers to an easy 99-82 victory over the Nuggets. Jamal Murray scored 18 points for Denver in the loss. Damian Lillard delivers a pass around the defenders to Caleb Swanigan for the layup. Caleb Swanigan sprints down the floor to slap away Will Barton's layup. Off the inbounds pass, Caleb Swanigan hits Damian Lillard who fires up a quick lay-up.